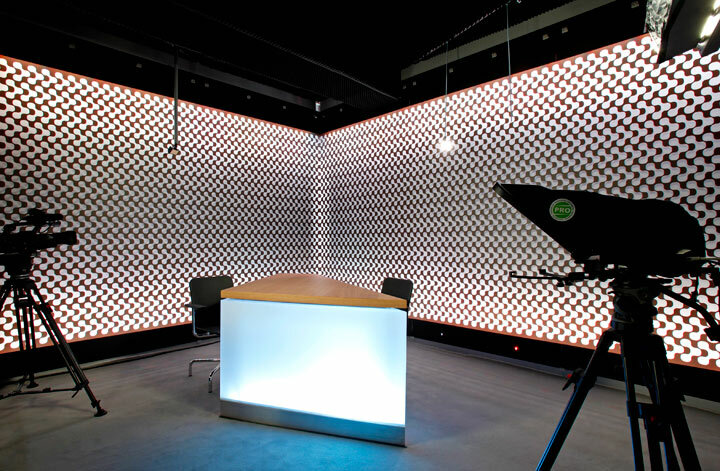 Luxembourg based media group ‘Maison Moderne’ has commissioned me to design a TV set for its new venture, paperJam TV. The design concept is based on an intricate curtain wall featuring numerous cut-outs based on the pattern of the existing paperJam logo. The idea was to create a notion of visual depth and shadows that ‘texture’ the background in an otherwise extremely confined space (4,5m X 3,5m). The pattern also helps to blur the scale and make the space appear larger then it really is. Additionally we installed RGB LED’s to graze up the walls behind the hanging ‘curtains’. These LED’s are individually addressable, enabling the background to be animated by gently pulsating and changing colour schemes.